For some, asking for money is far more daunting than riding 200 miles. For others, fundraising is practically second nature. Regardless, raising money for our beneficiaries is the primary focus of the AV200. Without our riders and the donations they secure, our partners could not make the significant impact they're making in stopping HIV/AIDS! We understand asking friends, family and associates for money may put you out of your comfort zone. But consider the 35 million people affected by HIV/AIDS. Think of the daily challenge this disease presents for them. When you look at the challenges the Ride's "ask" and "task" present, they pale in comparison to the struggle most face when living with HIV/AIDS. So that we can make as large an impact as possible, all riders must raise a minimum of $500 to participate in the AV200. Not to worry, few, if any, serious participants have failed to meet this minimum! To make you as successful as possible in your fundraising efforts, we've provided some useful information below. And, between the time you register and the Ride, the AV200 Steering Committee will offer personalized help for any rider needing a bit more confidence asking for support! Goals are a motivational tool and will keep you going. Determine your personal goal and let your supporters know the dollar amount you want reach. Once registered, you will have the ability to create your own AV200 webpage where people can donate to you online, see why you are riding and monitor your progress towards your goal. Personalize the experience for your potential donors (and for yourself) by putting into words why the AIDS Vaccine 200 is important to you. This personalizes the Ride for them and creates a stronger bond between friends. SEND EMAILS AND LETTERS. LEVERAGE SOCIAL MEDIA. Send an announcement of your plan to participate in the AV200 to friends, business associates, church members, family, and old acquaintances -- anyone you come in contact with! Do not forget companies, organizations, and school newsletter lists. Work Facebook and Instagram like there's no tomorrow! Remember to follow up with as many of these individuals as possible after they have received your communication to answer questions and bolster your request. You'll be surprised how many people you know have been touched by this disease - and want to help you fight it! Make the first pledge yourself. When your friends and family members see your name and a contribution, they will see how serious you are. Join our AV200 club on STRAVA, a GPS cycling social media website. Record your training rides and post them to social media websites such as Facebook so potential donors can see that you are devoted to preparing for the ride. Just because you did not get a response, or someone already gave, doesn't mean you shouldn't ask again! Many times people put off making a donation. They need to be reminded. Remind Them! Also, your friends and family and colleagues want to see you make your goals. Ask them to donate again to help put you over the top! Find the right time for you to thank your donors. Drop them an email. Say thanks via Facebook. Handwrite a note so they get a surprise in the mail. And most importantly, keep them up-to-date on your progress. They'll feel included in fighting the good fight and will provide another level of support during your amazing journey. Fundraising for the AV200, or any other cause, can be challenging, but with the help of these nine steps, you can raise up to $1000 (or more) in NINE DAYS! DAY 10 – Share your success with a friend! Your grand total will be $1,000! Don’t forget to tell everyone their pledge is tax deductible! Matching gifts are an important source of donations for all non-profit organizations and the AV200 is no exception. Every dollar counts, so it’s extremely important for nonprofits to maximize all sources of donations. But what exactly are matching gifts and how are they handled by the AV200? A matching gift is a charitable donation made to a qualifying nonprofit organization by a matching donor (usually a corporation) with the requirement that an original donor (usually an employee of the corporation) first makes a gift toward the nonprofit organization. A 1 to 1 matching is the most common scenario, but others also exist. Many employers will process matching gifts for “donations of time” at set rates “per hour” of volunteered time, and some also offer matching opportunities for spouses and retirees. The following steps must be completed to finalize matching gifts; so, it’s easy to see why the process can take up to six months to complete. After making the initial donation, the employee must apply for the match, usually through the Human Resources area of the company. The company notifies the nonprofit of the matching gift request and asks them to validate that the donation was received. The nonprofit researches and validates receipt of the gift, usually through an on-line site. The employer cuts the check to the nonprofit. The vast majority of corporations cut “matching gift” checks once every three months. Action Cycling Atlanta (the 501(c) (3) entity of the AV200) is a qualifying nonprofit organization and, thus, receives matching gifts. In determining how these funds should be used, the organizers of the ride and the Board of Directors looked at all income sources while factoring in the total cost of organizing the best ride possible, and the mission of the organization. It became clear that matching gift funds were crucial to help meet budgeted operations, and the Board voted to steer “matching gifts” to cover the cost of the Ride. This ensures that 100% of all donations from individual donors raised by participants and volunteers are donated to our charities. Nonprofit entities are limited in the direct marketing than can be done in the matching gift area, so we want to be sure you know about this source of funding and how important it has become to the success of the AV200. 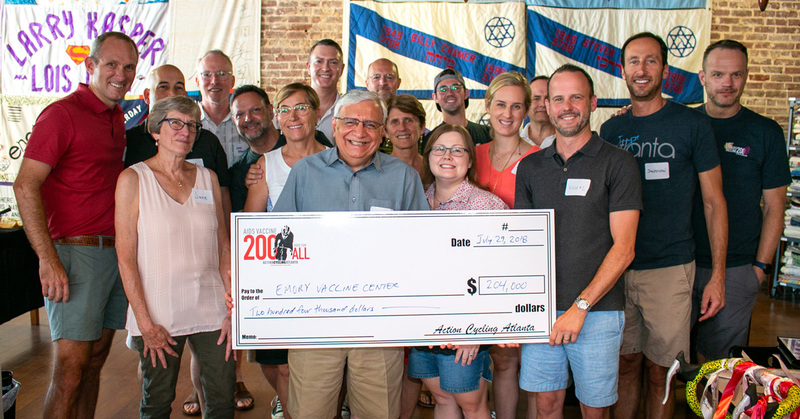 The Board and Steering Committee of Action Cycling Atlanta and the AV200 would like to thank our participants and donors for their efforts in obtaining matching gifts and encourage you to continue to tap into this resource! We are also periodically evaluating the use of matching gift funds as the ride and related fundraising efforts evolve to ensure we are applying them as efficiently and practically as possible and will certainly let everyone know of any changes in this area. Thanks again and please send any questions regarding the status of your matching gift or any other questions about this process to finance@av200.org.